Posted on November 6, 2007	by Linda S.
I came across this site the other day and was impressed with the simplicity of it…now why didn’t I think of that? !! grin All Buttoned Up is one of my favorite blogs to read and has this terrific tutorial for using silicone caulk to make the bottoms of felted slippers not only skid proof but last longer. After I crocheted the slippers/socks in the pic my first thought was…”but they don’t last very long!” Guess what’s gonna happen now! 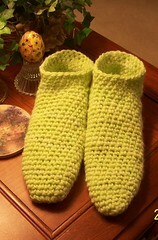 This entry was posted in Crafts, Crochet, Tutorials. Bookmark the permalink.